This page is an attempt to document an obscure corner of Wacky Packages lore: an entire series of stickers that was left unpublished in 1992. For information on the stickers you remember from the '70s and '80s, visit the most comprehensive resource on all things Wacky: Greg Grant's Wacky Packages Web Site. 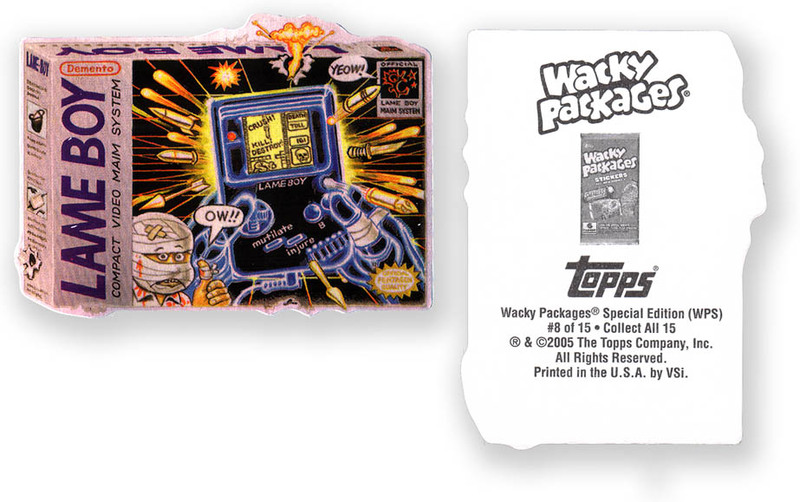 Go to LostWackys.com, the "Home for Orphaned & Unpublished Wacky Packages", for more information on unreleased parody cards and stickers, and for up-to-the-minute news on Topps' latest Wacky offerings. 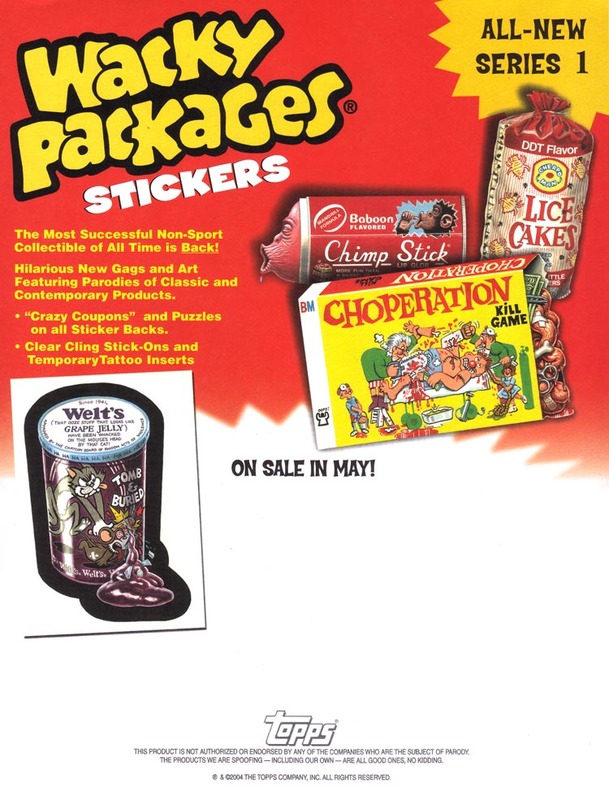 (05/18/08) - Two 1992-era titles, Sea Honkies and Granny Hairs, were finally published: as bonus sticker inserts in a new Wacky Packages hardcover book. (2007) - A number of previously-unseen 1992 parodies by Pat Piggot surfaced in a fan-produced set of Lost Wackys stickers. Titles include "Chia Punk", "CarpiSun", "Spleen Beat", and "Barfie." 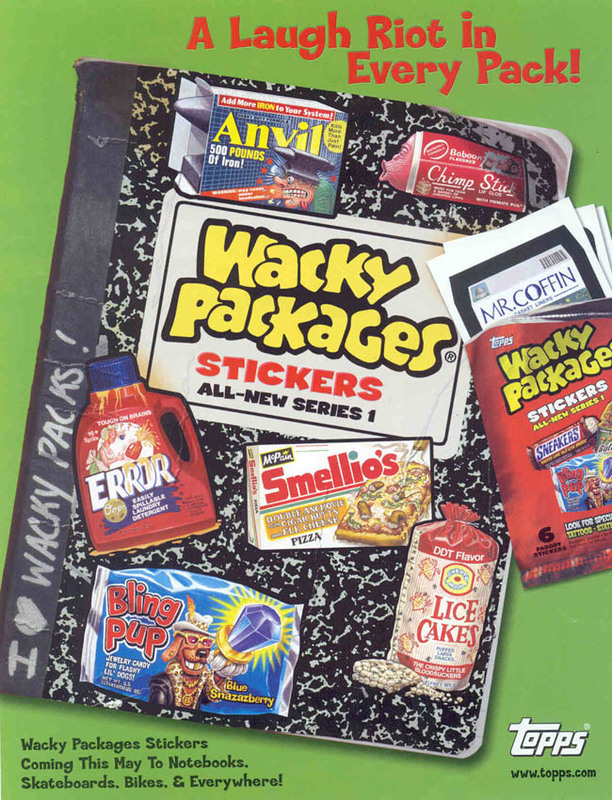 Following a 6-year period in which the irreverent Wacky Packages brand had lain dormant, The Topps Company released an all-new series of product parody stickers in 1991. The set contained 55 titles, including spoofs of Pez candy ("Prez"), Dunkin' Donuts ("Drunken Donuts"), and Domino's Pizza ("Donkey Nose Pizza"). The '91 series received at least two printings in the United States, as well as a run by Topps' Canadian licensee O-Pee-Chee in 1992. But Topps did not release a follow-up set, and several reasons have been advanced for this. The Wacky Packages Gallery claims that the 1991 Wacky series was eclipsed by the popularity of Topps' own Desert Storm cards that year. According to series editor Mark Newgarden in a 2002 interview, "the legal atmosphere was a little too dicey for them to keep doing that stuff. But it was mostly distribution," that spelled the end of Wacky Packages in the 1990s. During the making of the '91 set, Topps had planned to release perhaps as many as two further series. 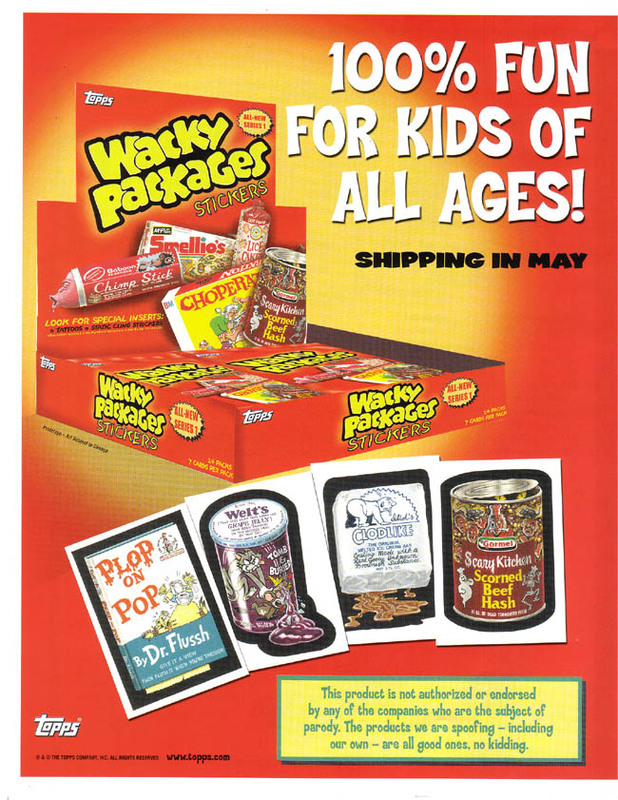 But as artist John Pound reports on his web site, "Another Wacky Packages series scheduled for 1992 was nearly completed, when Topps halted production in mid-1991." With the cancellation of the 1992 series, the titles that were finished and in-progress at the time became what are known in collecting circles as "Lost Wackys". 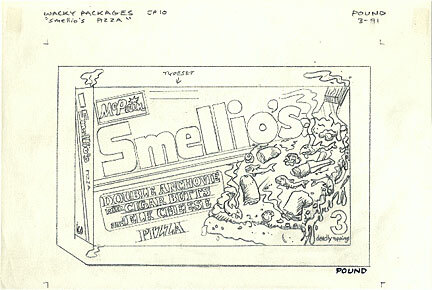 The Wacky Packages Art section of John Pound's web site, which for some time was the principal source for information on the unpublished '90s Wackys, contains a list of abandoned titles that Pound worked on and scans of his pencil art for some of them. 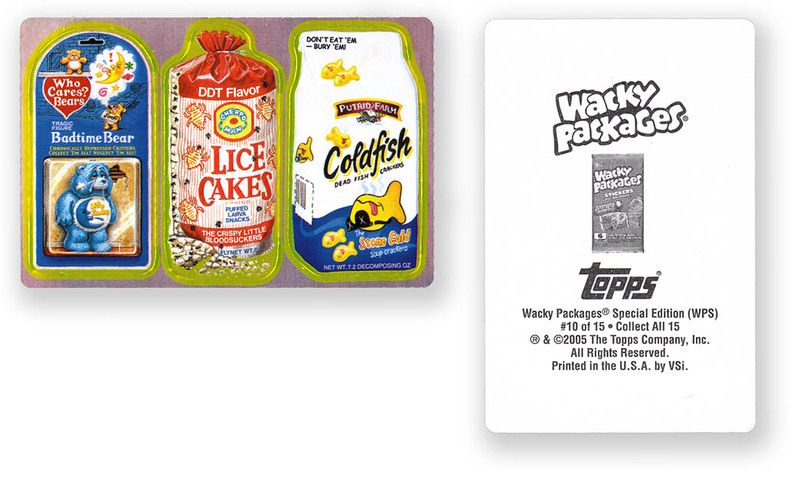 Topps mined 13 titles that were intended for the 1990s sets for Wacky Packages All-New Series 1 (ANS1), released in May 2004. Another title became a bonus card in All-New Series 2 in 2005. Whether any of the remaining unpublished titles from the '90s will see the light of day in future series is uncertain. Some of the products that they lampooned no longer exist, or the packaging is now too different to be recognizable; others may not meet Topps' standards of what is appropriate for today's school-age children, the intended primary audience for their trading card sets. Collectors have obtained copies of the art for some of the unused 1990s titles. It is possible that more of the unpublished '90s Wacky art will surface as Topps conducts further eBay auctions from its archives. Some of the work is still quite funny, and deserves to be rescued from obscurity. Tom Bunk painted 19 Wacky Packages card fronts and 21 coupon backs for the 1991 series. He painted at least 18 pieces for the 1992 set prior to its cancellation. Six of his unused '90s paintings eventually appeared in ANS1. 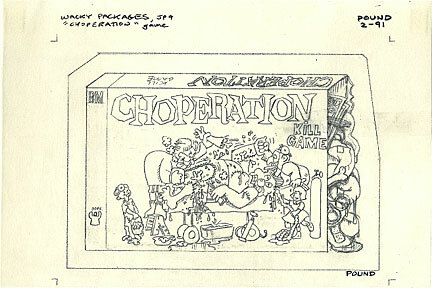 Jay Lynch wrote gags, drew rough sketches, and provided final art for many series of Wacky Packages, from the 1970s through the current All-New Series. Mark Newgarden was the editor and one of the writers of the 1985 and 1990s-era Wacky Packages sets. 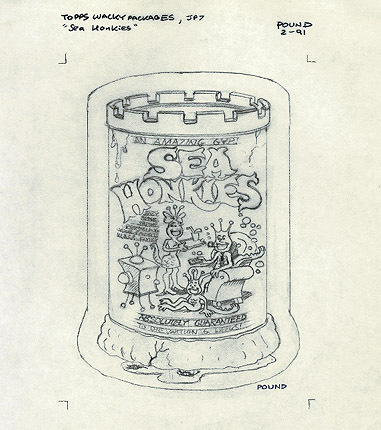 John Pound painted Wacky Packages for the 1985 and 1991 series and worked on at least twenty potential titles for the cancelled 1990s series, seven of which were finally published in 2004. Frank Santopadre wrote gags for Topps in the '90s and has contributed to the All-New series of Wacky Packages and Garbage Pail Kids. It is likely that the Lost 1992 Series would have included 55 stickers, as in the previous year's set. 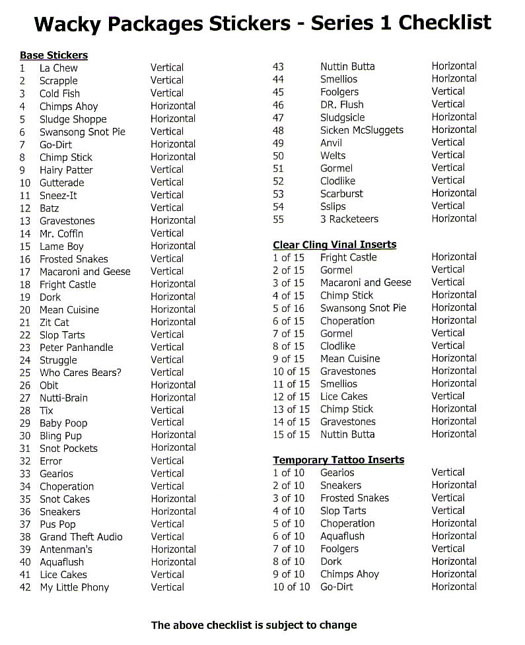 It is not known how many were developed before the series was abandoned, but the titles in the drop-down list below were all potential '92 stickers. Some of John Pound's pencil drawings include notes in the margins that indicate the month and year in which they were drawn (such as "1-91") and—it is assumed—the order in which he drew them ("JP1", "JP2", etc.). Where this information is available, the titles have been organized accordingly. Connections: The 1992 "Mumps" would have been the second parody of a Reebok product in a row, following 1991's "Reekboks"—perhaps demonstrating Topps' need to lean on companies who had not yet sent them cease and desist letters. While there had never been a shoe parody in a Wacky Packages series prior to 1991, Topps had considered at least one in the 1970s: a spoof of Keds sneakers, "Sleds," as seen in a rough by Jay Lynch. The text on a "Gravestones" image found on Frank Santopadre's web site differs slightly from that of the ANS1 version of the sticker. The Santopadre version's (perhaps temporary) text is, "Your favorite stone age family is now extinct," whereas the printed sticker reads, "Your favorite stone age family has been extinct for 300,000 years." Topps sold the finished art for "Gravestones" in an eBay auction that ran from July 17-24, 2004. 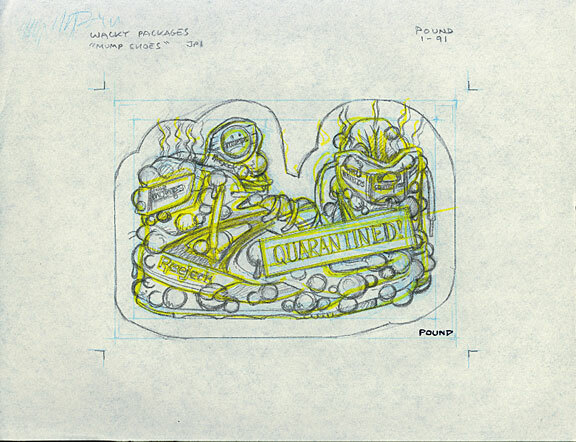 Connections: Earlier in Wacky Packages history, Jay Lynch submitted a rough for a Flintstones Vitamins takeoff called "Gallstones" which was never produced as a sticker. Notes: The title "Lame Boy" appeared as Base Sticker #15 on the preliminary checklist of ANS1 in February 2004. It occupied the same spot on the final checklist when the series was released in May. In February 2005, the "Lame Boy" image became a licensed vending sticker. Topps sold the finished art for "Lame Boy" in an eBay auction that ran from July 18-25, 2005. Connections: "Lame Boy" is Topps' second Wacky based on a Nintendo product, following 1991's "Stupid Moron Bros. 2." 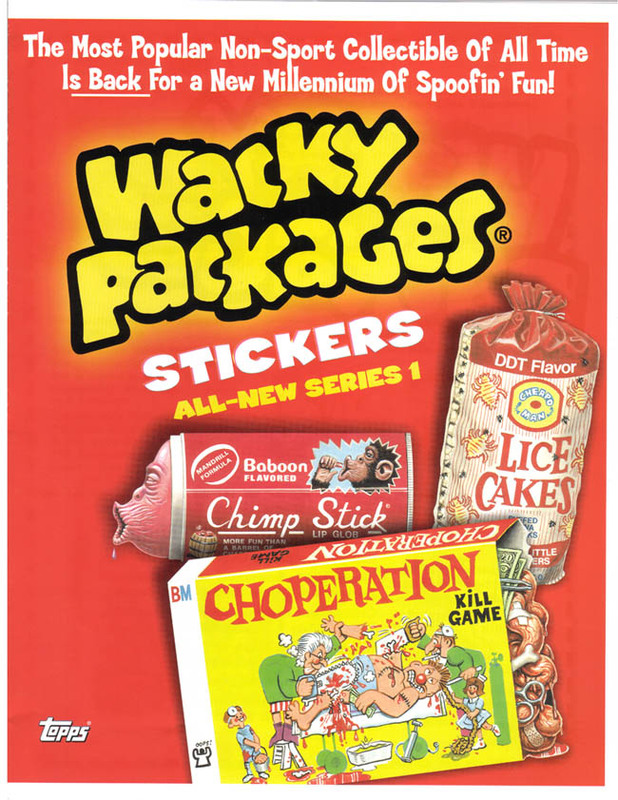 * The promotional images of "Choperation" did not include a great deal of the text of the sticker, which was revealed when the completed version was published. Connections: Operation is the second Milton Bradley board game to become the subject of a Wacky sticker; the first, 30 years prior, was Candy Land, which inspired "Brandy Land" in 1974's 12th series. As Promo card #2 of 3, released in Garbage Pail Kids ANS2 packs and elsewhere. The promo sticker was the same size as a standard trading card, but the Sludgsicle image was smaller than a typical Wacky to allow for the inclusion of the logo on the front of the card (and perhaps to distinguish a peeled promo from the later published sticker). In February 2005, the "Sludgsicle" image also appeared as a licensed vending sticker. 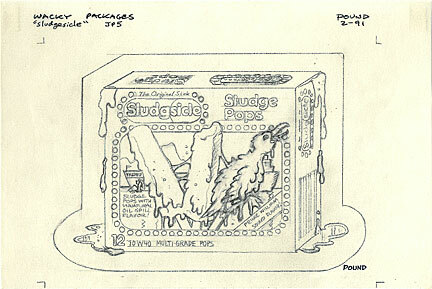 Topps sold the finished art for "Sludgsicle" for $2650.00 in an eBay auction that ran from May 11-18, 2006. Connections: A "Sludgesicle" parody first appeared in the 1969 Wacky Ads series. Other Popsicle brands received the Wacky treatment: "Plopsikle" (series 5, 1973-1974) and "Screamsicle" (13th series, 1975). Curiously, "Sludgsicle" is the second Wacky sticker to depict a waterfowl impaled on a stick and covered in brown goo: it was preceded by 1991's "Duck Bar". Notes: Girl Talk was originally produced by Golden Books, hence the "GOLD IN our banks" logo on the pencil art. 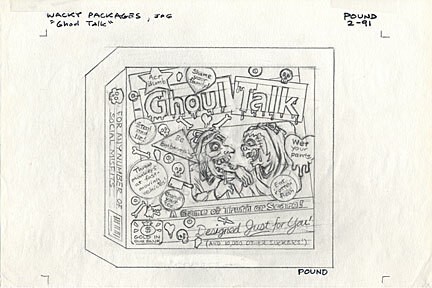 The game is now made by Hasbro/Milton Bradley with different packaging, so "Ghoul Talk" would most likely need to be updated if it were included in a future series. Connections: Hasbro/MB released a "Bratz" edition of Girl Talk; the Bratz dolls were the subject of the "Batz" sticker in ANS1. Notes: The Mickey Look Viewer is not currently produced by View-Master, decreasing the likelihood that Topps will release this title in a future series. 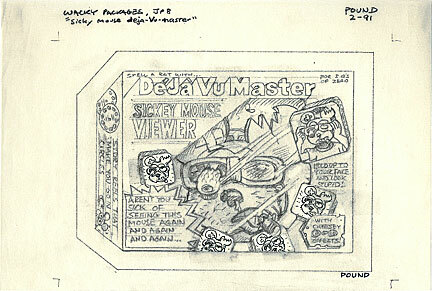 Connections: Topps' first View-Master spoof, "View Monster," appeared in the 15th series, circa 1975. Topps sold the finished art for "Smellio's" in an eBay auction that ran from August 19-26, 2004. Notes: The various Richie Rich comic book series (along with the rest of the Harvey comics titles) ceased publication in the mid 1990s, decreasing the likelihood that "Richie Retch" will appear in a future series. 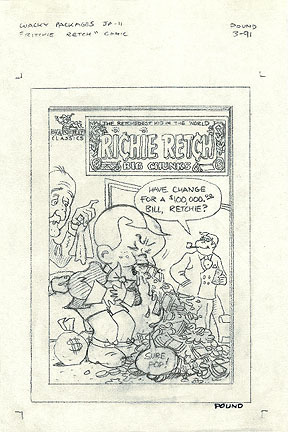 Connections: Topps' 5th series of Garbage Pail Kids included an unrelated "Richie Retch" gag, also painted by John Pound. Topps sold the finished art for "Welt's" in an eBay auction that ran from August 25 to September 1, 2004. 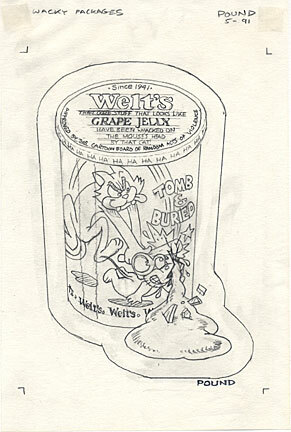 Connections: Welch's Grape Jelly was originally parodied in the 1974 Wacky Packages Series 9 as "Belch's Grape Wine Jelly." And Welch's Grape Juice was spoofed in the 1991 series as "Squelch's Ape Juice." Notes: Topps has eliminated parodies of liquor products in its 2004 sets, rendering this title an unlikely candidate for inclusion in a future series. Connections: Despite the apparent ban, the back of the "Bling Pup" sticker in ANS1 features a liquor-themed parody of America Online called "Americans OnWine"—the central image of which is recycled from the 12th series sticker "Barman Barroom Tissue." The first Disney character to be lampooned in Wacky form was Bambi, in the 1991 "Bambo" sticker. Topps sold the finished art for "Gormel" in an eBay auction that ran from May 9-16, 2005. Connections: Another product from the same company was previously parodied in 1975 by Topps, when Hormel Chili became "Sore Mel Chili" in the 15th series. 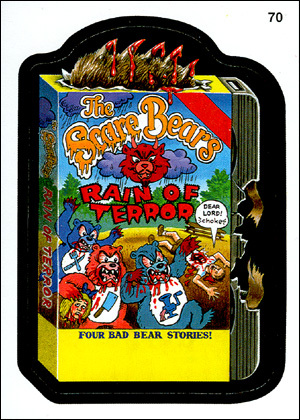 Connections: In the late 1980s, Topps attempted to capitalize on the success of their Garbage Pail Kids by tackling the Care Bears in a parody button series called Gross Bears. In 2004, a new Care Bears parody, "Who Cares? 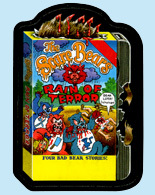 Bears", was conceived by Jay Lynch and painted by John Pound for ANS1. Connections: "Unlucky Dog" would have joined a list of other Purina pet food take-offs in Wacky history: "Putrid Cat Chow" (2nd series, 1973), "Choke Wagon" (4th series, 1973), and "Yuppie Chow" (1991 series). Despite previous cease-and-desist letters over "Putrid" and "Choke Wagon", Ralston-Purina products were probably considered fair game for parody in the 1990s, since the company had sponsored a cereal premium promotion in conjunction with the 1982 Wacky Packages Album Stickers series. Notes: This title may have been left out of the 1991 Series because there were already two Dr. Seuss parodies in that set ("One Fish, Two Fish, Red Fish, Dead Fish" and "Rat in the Cat"). However, it was not released as a printed sticker in 2004. 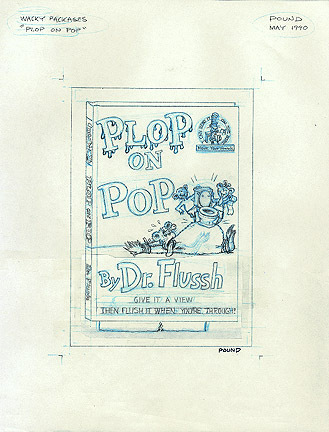 "Plop on Pop" was replaced on the checklist by another title, "Dead Bull", for reasons unknown. "Plop on Pop" finally saw print as the Bonus Sticker (numbered B4) found in All-New Series 2 Bonus Boxes. Notes: In February 2004, the title "Antenmann's" appeared on the ANS1 preliminary checklist as Base Sticker #39, "Antenman's [sic]." It was assumed in advance of the series' release that John Pound's art bearing the same name (listed for some time, though not pictured, on his web site) would be used. However, according to artist Jay Lynch, Topps could not find Pound's completed art for inclusion in ANS1. Therefore the "Antenmann's" title was repainted by Zina Saunders from a photocopy of Lynch's original rough. Saunders' version was used as both a sticker and vinyl cling (#6 of 9) in the 2004 set. Connections: If this title was to be a parody of Cookie Crisp, then it had been preceded by the 1982 Wacky Packages Album Stickers series entry "Crookie Crisp." Topps partnered with the Ralston-Purina company that year to include stickers in specially-marked cereal boxes. Connections: The title "Orangutina" in 2005's ANS2 release was a new take on the Orangina product. Connections: White Castle Hamburgers were parodied as "Fright Castle Ghoul Burgers" in ANS1. 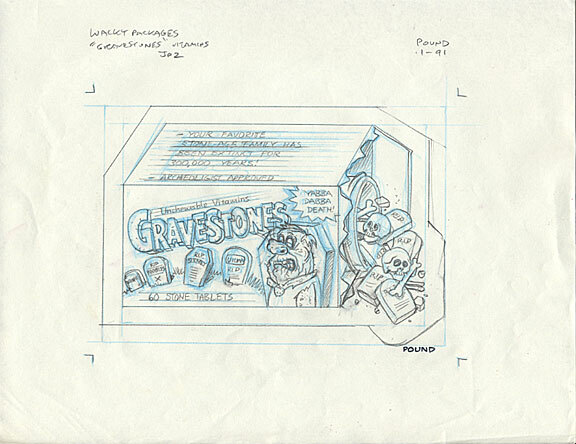 The original rough by Jay Lynch, and the first version of the painting by Tom Bunk, carried the subtitle "Greaseburgers"; this was changed to "Ghoul Burgers" by Topps between the release of the "Fright Castle" promo and the final published sticker to appease the White Castle company. Connections: "Bimbo" is one of several Disney product parodies considered for inclusion in the 1992 series; see "Bucktales", "Deja Vu-Master Sickey Mouse", and "The Little Barmaid". Connections: Topps considered several other Disney product parodies for inclusion in the 1992 series; see "Bimbo", "Deja Vu-Master Sickey Mouse", and "The Little Barmaid". Topps sold the finished art for "Chimp Stick" in an eBay auction that ran from May 3-10, 2005. The art was originally attributed to John Pound in the auction text, but the Topps Vault added a correction. The original painting contains a spelling error ("lips" is spelled "lipps") that was fixed during the production process; the error does not appear on the printed sticker. Connections: The original Chap Stick lip balm was spoofed as "Cheap Stick Lip Bomb" in 1975's 15th series. In addition, a rough for "Slap Stick" was once submitted by Jay Lynch, but never produced. Topps sold the finished art for "Clodlike" in an eBay auction that ran from April 18-25, 2005. Notes: In February 2004, "Coach Motel" appeared in the first wave of articles (such as the 2/13 icv2.com piece) promoting Wacky Packages ANS1. In March, the title was published as Promo card #3 of 3, issued in Garbage Pail Kids ANS2 packs and elsewhere. For weeks after the late May release of the 2004 series, it appeared that "Coach Motel" would not be included in the set in any form other than as the promo. However, the title finally showed up as the B2 sticker only available in a Bonus Box sold at Target and other outlets. "Coach" replaced "Gooya" at the last minute, after Topps decided that the latter title was too insulting to the subject. The Topps Vault sold the finished "Coach Motel" painting for $3383.33 in an eBay auction that ran from February 1-8, 2006. Connections: "Cranked Out" would have been a second Wacky spoof of Cracked magazine, following the 13th series' "Crocked" in 1975. Image: Comparison of the version produced in 1992 and the version that would have been printed in 2004. The text was changed slightly, altering the gag. Notes: In 2004, "Gooya" was intended to be the second exclusive ANS1 sticker (numbered B2), available only in a Bonus Box sold at Target and other outlets. 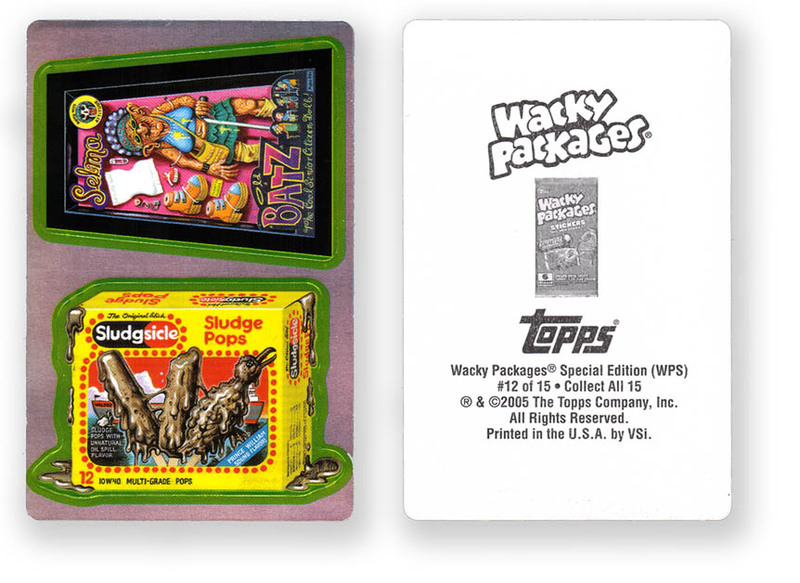 Topps displayed the image to the ANS1 creators in an internal "Wacky Bible" document prior to the series' release. However, "Gooya" was replaced by "Coach Motel" after Topps rethought their standards concerning the portrayal of food as infested with bugs. The Topps Vault sold the finished art for "Gooya" in an eBay auction that ran from November 11-18, 2004. Connections: Sunshine products have been parodied six other times over the years: "Moonshine Wheez-It Crackers" (3rd series, 1973); "Moonshine Hyde's Rox Cookies" (4th series, 1973); "Funshine Ha Ha Crackers" and " Sanitarium Krazy Crackers" (5th series, 1973-74); "Sunstroke Creature Crackers" (7th series, 1974); and "Stuntime Sneez-It Crackers" (ANS1, 2004). Connections: See the entry for "Mr. Potato Famine" for other Playskool products which have been spoofed as Wacky Packages. 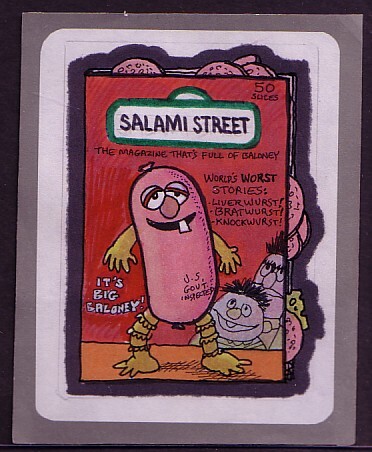 Connections: In the 1970's, Art Spiegelman did a rough for a Sesame Street Magazine parody called "Salami Street" that may have been intended for a Wacky Magazine Stickers spinoff series, but it was never published as a sticker. The "Salami Street" art was auctioned in a Topps Vault eBay auction in 2004. Greg Grant received the original art for "Lice Cakes" from Topps as part of the trade for Grant's www.wackypackages.com URL. Grant subsequently auctioned the art on eBay. 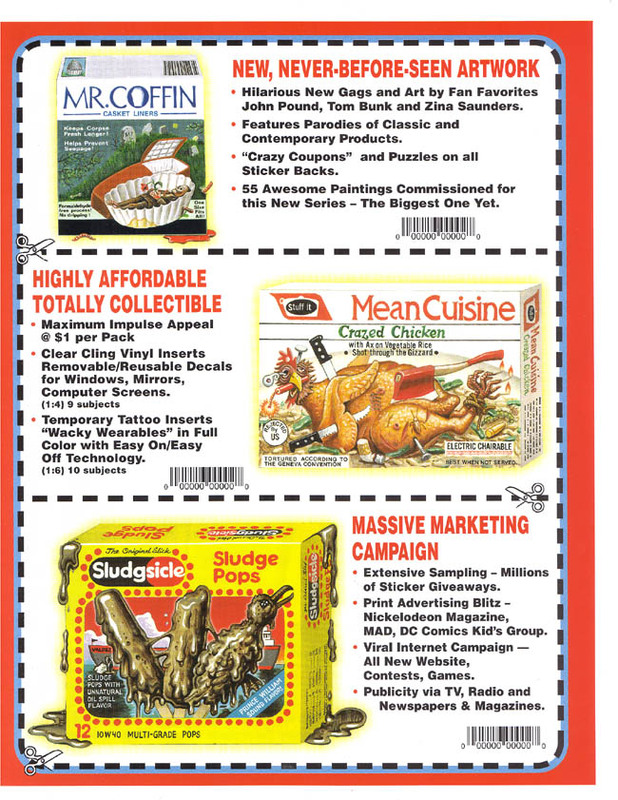 Topps sold the finished art for "Mean Cuisine" in an eBay auction that ran from May 17-24, 2005. The original painting contains a spelling mistake that was corrected before publication. As Promo card #2 of 3, released in Garbage Pail Kids ANS2 packs, Previews magazine, and elsewhere. The promo sticker was the same size as a standard trading card, but the "Mr. Coffin" image was smaller than a typical Wacky to allow for the inclusion of the logo on the front of the card (and perhaps to distinguish a peeled promo from the published 2004 sticker). The "Mr. Coffin" promos can be found with two easy-to-miss variations on the back of the cards. Image: Scan of the original art (courtesy of Tom Bunk by way of Aaron Booton). Note that the text is somewhat different from that in the image linked above. 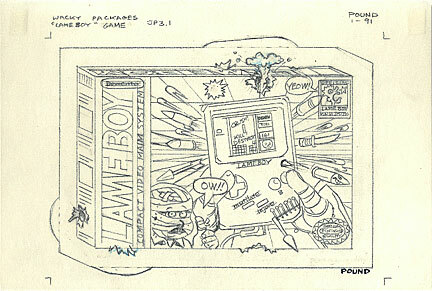 Connections: "Glove" is one of two Nintendo parodies that the 1992 series could have included, along with "Lame Boy". Connections: Snookered would have followed 2 previous Wacky spoofs of Smucker's products: "Smoocher's Jam" (8th series, 1974), and "Trucker's Strawberry Traffic Jam" (1991 series). Connections: Tootsie Roll products inspired two previous Wacky stickers: "Footsie Roll" (6th series, 1974) and "Tipsy Roll Pop" (series 16, 1977). The following titles are of 1990s vintage, but are not as well-documented as some of the titles above. The backs of the 1992 cards would have contained checklists, puzzle pieces, and "crazy coupons." The subject of the puzzle(s) is not known (that may not have been determined before the series was cancelled), but parodies of Topps products were typically used for the puzzles to protect against having to replace one due to a cease & desist request. Mark "Buz" Best - for Wacky camaraderie, and for observations such as the link between the ducks on "Duck Bar" and "Sludgsicle"